Back in June, Vodafone announced 7 cities will be part of 5G trials starting in July. In October, Vodafone announced that they have became the first company in the UK to carry full 5G over a commercial network. Live mobile data traffic was being streamed to and from the Internet exclusively over 5G from a site in Salford, Greater Manchester, connected to Vodafone’s nationwide converged fibre network. Vodafone further said as a part of the same announcement that their network engineers were already achieving high-speed Internet connectivity and low latency from the Salford site using Active Antenna (Massive MIMO) technology. This effectively provides multiple-data ‘channels’ from a single antenna, coupled with the 3.4GHz 5G spectrum. Vodafone secured the largest block of this 5G spectrum at this year’s auction. In September, Vodafone made UK’s first holographic call using 5G. 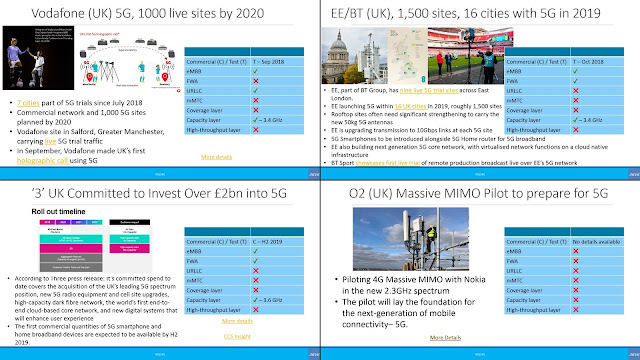 EE, part of BT Group, has nine live 5G trial sites across East London. The first commercial quantities of 5G smartphone and home broadband devices are expected to be available by H2 2019. According to CCS Insight, Three now owns about 24 percent of all spectrum suitable for 4G and 5G services. This, it says, places it ahead of BT (21 percent), Vodafone (19 percent) and O2 (15 percent). The remaining 20 percent, which consists of 700 MHz and 3.6 GHz airwaves, is earmarked for sale by Ofcom in late 2019. Customers of Three already use 7.6GB of data per month, more than three times the industry average. Based on projections from Ofcom, Dave Dyson, CEO, sees a scenario in which this usage surges to 90GB per month in 2025. Note that this prediction has increased from 56 GB per month in 2025 as we earlier reported. O2 has the least amount of announcements and information on 5G. In a recent press release, it announced that it has launched a pilot to boost London network ahead of 5G. The pilot is effectively saying that O2 is working with Nokia on two Massive MIMO trials in Kings Cross and Marble Arch (in London), aimed at enhancing connectivity for O2 customers and paving the way for the future deployment of 5G across the capital. The pilot is in the newly acquired 2.3 GHz spectrum. The pilot will lay the foundation for the next-generation of mobile connectivity– 5G. On the positive side, Ofcom confirmed that O2 had delivered against its commitment to provide 98% indoor 4G coverage and 90% geographical landmass mass coverage across the UK.